Asthma affects approximately one in thirteen Americans, leading to costs associated with lost productivity, absenteeism, and mortality in the tens of billions of dollars each year. Improving indoor air quality (IAQ) presents significant financial incentives for U.S. schools and businesses. Asthma places a significant economic burden on the United States, with a total cost of asthma, including costs incurred by absenteeism and mortality, of $81.9 billion in 2013. [...] the U.S. yearly return on investment (ROI) from improved indoor air quality — including asthma reduction — equaled $20 to $200 billion in enhanced worker performance, and that fiscal benefits may exceed costs by 900 to 1,400 percent. The quality of worker and student output. Low-quality indoor air is also a precursor for a documented challenge facing facilities managers, especially in older buildings, commonly referred to as sick building syndrome, whereby occupants routinely experience cold or flu-like symptoms that only appear while inside of the afflicted facility, which disappears entirely shortly after exiting the building. Additionally, in the right conditions, poor indoor air quality can induce asthma or asthma-like symptoms in susceptible groups, such as young children, after prolonged exposure, leading to a lifetime of respiratory issues and other health complications. 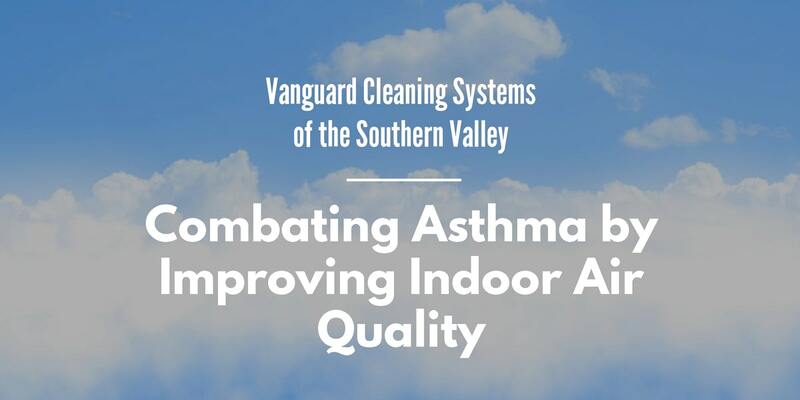 Fortunately, there are several cost-effective methods that can be introduced into any environment to reduce or eliminate agents contributing to poor IAQ, including routine cleaning with specialized equipment and the removal of elements associated with asthma triggers. Accurately identifying and eliminating the source of indoor asthma triggers is the first step towards improving IAQ. Integrated pest control - Specifically, cockroaches, which are known to aggravate asthma conditions and reduce IAQ. Professional cleaning services - Routine facilities cleaning and maintenance, which we will discuss below, with the proper equipment, has a demonstrable positive effect on IAQ. Implementing green cleaning practices with a focus on cleaning for health first into your facilities maintenance program has been shown in numerous studies to positively impact occupant health, productivity, and IAQ. Vacuum at least once, preferably twice, per week with a Certified Asthma and Allergy friendly vacuum to remove dust and other asthma triggers from carpeting. Dust regularly, preferably with a microfiber system that allows custodial workers to quickly reach areas harboring high-dust, which when disturbed, can become airborne and introduced into the HVAC system and spread throughout your facility. Thoroughly ventilate all facility areas after carpet, upholstery, or floor cleaning services. Asthma is a debilitating respiratory illness that affects millions of Americans, often contributing to a lifetime of health issues and reduced capacity to participate in numerous activities, as well as challenges working in specific environments and professions. Reducing asthma triggers and improving indoor air quality has been repeatedly shown to have positive benefits for all building occupants, not merely those suffering from asthma or prone to asthma-like symptoms. Conditions in the Central San Joaquin Valley, especially during the summer months, present significant financial challenges for schools and businesses already confronted with increasing issues regarding the cost of custodial staff retention and training. Outsourcing your facilities custodial and other green cleaning services is a cost-effective method for improving indoor air quality and occupant health. If you would like to learn more about the benefits of outsourcing your school or businesses cleaning and infection control services to combat asthma triggers and improve indoor air quality--contact us today for a free quote!